Lifesize Bronze Statue of Bon Scott ACDC - bronze tribute memorial statue to the great Scottish born lead singer of the Rock group AcDc, to be sited at his birthplace in Kirriemuir, Scotland In progress. Lifesize Bronze Statue of Dorothy Round - bronze tribute memorial statue to the great British Ladies Wimbledon champion of the 1930's. Unveiled at Priory Park, Dudley 20th Sept 2013. Bronze Panels for Dunville Park, Belfast. Series of bronze cast panels for a new build community building sited in Dunville Park. Black Watch Memorial Soldier: shortlisted for memorial statue statue for Polygon Wood, Ypres, Belgium. Restoration work on Queen Victoria & Prince Albert Equestrian monuments in George Square, Glasgow. See blog site http://johnmckennasculpture.blogspot.com/ November posting. Replacing and repairing bronze sections of the Baron Marochetti bronze sculptures, casting the bronze pieces here at the A4A studio foundry. Lifesize Bronze Statue of Jimmy 'Jinky' Johnstone - voted the greastet ever Celtic player, one of the Celtic 'Lisbon Lions'. Sited in a memorial garden at his birth place in View Park, Uddingston, Glasgow. Lifesize Bronze Statue of Jock Stein - the legendary Scotland and Celtic Football club manager who lead the first team in Britain - the great Celtic FC, to win the European Cup in 1967. Unveiled 5th March 2011 by Dr. John Reid and former the Celtic football team, sited at Celtic Parhead stadium, Glasgow. The Auchengeich Mining Disaster - memorial bronze statue cast here at John McKenna' s fine art Sculpture foundry. Alifesize bronze statue acting as a centrepiece for the new memorial site built in memory of the Auchengeich disaster 50 years ago. Unveiled byScotland's first Minister, The Right Hon. Alex Salmond MSP. Hovering Kestrel 6m wingspan by 4m high stainless steel bird of prey sited 14m high up on a tower building for a new build site on the Black Country Spine Route, Wolverhampton. Images to follow soon. Flax Flowers and Associated Works with A4A associates Ann McCall and John Darren Sutton, casting bronze statues and fabricating large stainless steel sculptural structures, for a site in Banbridge, Northern Ireland. Brian Clough Memorial statue for Nottingham City shortlisted competition Our Design came second. Win some - Lose some! Brownhills Miner colossus 12+m high stainless steel statue for the town of Brownhills, Staffordshire. Design work for Walsall M.B.C town centre enhancement scheme, to include 6m high canopy & railings in stainless steel, street furniture. Squires Gate. Morris Homes -Housing Development Company, design and production of large brick relief panel and steel sculptural feature set into railings. Squires Gate Dudley and Devon Road, Wolverhampton. King of Olton and the Genie of Industry. 250m of decorative iron Railings and two pieces of stainless steel sculpture artwork sited at Olton and Longbridge railway stations. Project involved liaison with local community. Castle Vale Knight stainless steel sculpture, standing over 9m in height. Commissioned by Castle Vale HAT and SAINSBURY through public consultation and competitive selection by the local community. Castlevale, Birmingham. Jersey Cattle bronze group West Centre, St Helier, Jersey, Channel Islands, Life size group of Jersey cattle, consisting of two cows, bull and calf at water trough, cast in bronze. Seen by Her Majesty Queen Elizabeth II, during her visit to Jersey at The Royal Jersey Show. Frito-Lay Pepsi Cola for their international annual awards, cast in bronze. Tilly's Lane, Staines, two rivers project,relief panel, 2m by 3m curved and positioned at second story height. Industry of Brownhills, Walsall, galvanised steel relief sculpture depicting historical industries of the area. Quest at Whitehaven, two sailors, dog, drinking man and figure at canon. Lifesize in bronze. Working in collaboration with the OPTIMUM design company. Havant Hanging Baskets, Southampton, sea horse hanging baskets and finger signs. 'Hands on Pot ' largest Pot in Christendom, a giant 16 feet 5 meter high by 3 m diameter brick carved pot with a pair of potters hands around it. Yet to be sited in Stoke on Trent, home of the pottery industry. Rugby, brick relief sculpture panel 5m long by 1.3m high. This brick sculpture has been commissioned by Rugby Town Council, Warwickshire as part of their public arts policy. The photographs illustrate the brick sculpture at our studios in the clay state prior to being fired in the brick kilns. The sculpture measures 5m by 1.1m and will be in~situ by February year 2000. Art for Architecture were asked to design the sculpture scene and undertake the sculpture commission. As we have extensive experience in brick sculpture we designed the work with great sculptural detail, to create a complex relief surface, a speciality of ours. The sculpture relief contains images of the industrial history of Rugby. Its cement works - RUGBY cement, are still based there today. The train refers to the railway history of the town where there was a locomotive testing station and several railway companies had stations there including the London - Birmingham and Midland counties railway companies. The strange looking machine in the middle of the artwork is a Willans steam turbine generator, built around the turn of the century.On the right hand side a canal boat and bridge no 9 are depicted, as the Oxford canal was built around the Town of Rugby in 1773. Soaring above are Gloster Meteor jets, the designer of the Jet engine, Frank Whittle made his first prototype jet engines at the British Thomson Houston factory at Rugby. In the distance are the radio masts, which can still be seen from the M1 motorway going south past Rugby. "Saltmakers" Droitwich Saltworkers fountain: life-size family group cast in bronze incorporating a water feature to commemmorate salt making in Droitwich, Worcestershire.Photographs depict the claywork prior to bronze casting. The sculpture depicts a family of 19th century saltworkers, who sometimes stayed day and night at their brine boiling tank producing salt. The male figure stands bare-chested over a 'trough of boiling brine' with a salt rake, poised, ready to rake more salt to place into the wooden salt tub adjacent to him. The trough contains a small frothing water fountain to simulate the 'boiling brine tank.' Below the tank is a view of a canal salt barge bow 'drawing alongside.' Moving clockwise the female figure is upturning a wooden salt tub, tipping out the salt lump. In the heat and sweat of the salt workshop she works bare chested though occasionally minimal clothing, such as a thin camisole, was worn. This practice considered so immodest when working alongside bare-chested men, drew public comment regarding these working conditions for women. Continuing round the sculpture are lumps of salt drying and waiting to be shaped by the boy wielding a 'tapper' bat, to 'square' up the salt lumps. Alongside him is the salt barge ready for loading with the salt lumps down the Droitwich canal, which was built by James Brindley especially for the purpose. Coombes Croft Library, Haringey, London. Brick sculpture carved in radial stretchers, using brick clay from Hanson Brick. diametre approx. 6m by 1m high. Lucas Lion Stainless steel relief MAHA, at Aston, Birmingham. Lucas Lion fabricated in stainless steel and heat treated hieght 2.1m by 1.2m, commissioned for a housing development on former Lucas site at Newtown, Birmingham. Unveiled by Claire Short, minister and local MP, November 1998. Way markers for Midland Metro tram line along length of cycle path. Commission involved a working residency period of 20 days with severe learning difficulties students at the Glenvale School, Birmingham. These waymarkers designed by John Mckenna had to be artistic, informative, highly durable and vandal resistant. They were required to act as direction, distance and path markers upon the National cycle route, that is being created to run the length and breadth of the country. In West Bromwich, in the West Midlands part of the cycle route runs adjacent to the new midland metro light railway line. The initial design was conceived by McKenna and concept maquettes for it were made at a residency at a West Bromwich school - Glenvale school. The residency involved us working with the school children to consider aspects of the design and undertaking research regarding historical local industry. The design, was approved by the client, which drew upon the former hand-made nail making industry of West Bromwich as an inspiration source. West Bromwich was the nail making capital of the world during the 18th century but slowly declined into the 19th century and was replaced by other wrought iron industies, forging, chainmaking, foundries and gun making. In the 1880's the vast majority of nails were being cut by machinery but there was still a residual hand nail making industry run on a domestic scale, undertaken mainly by women workers. The waymarkers were fabricated by a4a and associates, - in the photographs can be seen the welding of the nails to the base plates, which are set below ground. The nails themselves and the main stem depict "rose cut" nails. This type of nail was hand forged, the metal being beaten whilst at red heat. This technique creates a faceted head to the nail which looks similar to a pyramid. The facets were incorporated into the waymarker head to present four sides and upon each was information pertinent to the placing of the waymarker and where appropriate a direction arrow. Design of shelter structure paving, bollards, cycle stands and decorative screening for the Coventry Park & Ride scheme at War memorial park, Coventry. Acted as lead artist in a community involved project. This project involved us in designing a park and ride scheme structure, large paved section, cycle stands and site bollards. At the design stage we were required to create opportunities for community artworks to be incorporated into the scheme. The final design was approved by public consultation and by accessing community organisations via a local artsgroup - ArtExchange - artwork features were generated, using the local community where possible. Above illustrates the rear of the structure with cycle stand and vandal resistant mesh carrying decorative screens. Dines Green people': These terracotta blocks were created during a community residency and were incorporated into a string brick course that circumnavigated a new community building. John Mckenna and four assistants worked with approximately 350 people on the Dines Green housing estate in Worcester, in the West Midlands. "We ran many community workshops accessing all generations across the community. Each participant was encouraged to undertake a humorous 'self-portrait' to be imprinted on a brick and used in the building structure. The scheme enabled many people in the community to participate in a community artwork and was very popular." The clay a smooth red, was from Ibstock building products, Staffordshire who fired the finished blocks at their Chesterton brickworks, near Stoke on Trent. 'Knots' brick relief sculpture comprising of two large knots 7.5 m/24ft wide by 1m/ 3ft high, tied around a pillar, sited on the enabling road route to the Greenwich Millennium site, London. Bronze Maps, Crystal Quarter, Stourbridge.showing locations of historical glass works and kilns. Stag emblem cast in bronze and mounted onto a wrought iron sign. The Signs were used at Barnerds Green, Malvern. The emblem depicts the Stag at rest beneath a pear tree, both being heraldic symbols used in the Malvern Town and chase heraldry. It was finely modelled in clay. Then a silicon flexible mould was made from the clay. This mould is a reversal of the image and silicon is used because of its ability to capture highly intricate detail, which is a characteristic of John Mckenna's work. A wax impression was made from this mould and then invested and finally cast in bronze, via lost wax technique.John McKenna's cast bronze stag was incorporated into a wrought iron work sign created by artist blacksmith Andrew Findlay. depicting musical instruments. Commissioned by the Crown Estate. "Strings": brick carved panel coloured with clay slips and engobes. One of a series of three panels, depicting strings, woodwind instruments and Brass. Each panel measures 3m high by 1m wide. Commissioned by the Crown Estates for the Crown property at Worcester, in the West Midlands. Bronze Roundels 7ft and 4ft diameter, bronze relief sculptures for Fosse Plaza development, Leicester. King Lear bronze relief panel 1.2m dimeter, Fosse Park, Leicester. Here is the panel at the foundry being chased, a process where the bronze is chisled, filed and surface finished by the sculptor prior to patinating. A panel such as this would be designed then finely modelled by the sculptor in clay. Following this a flexible mould is made from which is taken a delicate faithful wax impression which the sculptor would work in more detail if required. This wax would then be invested and cast into durable bronze. It is a lengthy process and involves intensive labour on both sculptor and founders' part. The original drawing was by artist Steve Field the Dudley Public Borough Artist and the modelling of the original clay by John McKenna, sculptor. 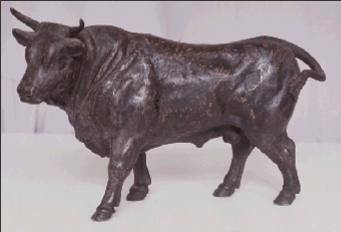 Castle Fine Arts foundry cast the work into bronze. "I love your majesty according to my bond; - no more no less"
Roman chariot upon the Fosse Way, cast bronze, Fosse Plaza, Leicester The site of this artwork is close to the ancient Roman road called - Fosse Way. This was an important link road, built by the Romans. It ran from Lincoln to Exeter enabling the Roman occupying troops to travel to their garrisons at various towns along the route and maintain order and facilitate transport. Steve Field the Dudley Public Borough Artist worked with A4A and designed the roundel, he drew inspiration for this artwork from the history of the area then the sculpture relief panel modelled by sculptor John McKenna in clay was lost wax cast in Bronze. Diameter of panel 2.4 m approx. Sandstone Roundel: This sandstone roundel was carved by John McKenna at a4a working with designs furnished by his associate Steve Field, of the Dudley Public Arts. The stone carving was for a gable façade at a school in Shropshire. The school had built a new science and technology block and this work was placed into a recess above the doorway. Green Man head, bronze relief, Dudley, West Midlands.Green Man bronze cast, above an entrance passage. 60 cms by 65 cms. The bronze is coloured - patinated, by heat treating the surface and applying various chemical solutions to achieve the green effect which is a stable colour chemically bonded into the bronze. Commissioned by Dudley Public Arts, modelled by sculptors John McKenna and Darren Sutton, cast bronze by Castle Fine Arts Foundry. Sculpture panels set into fence railings, Wolverhampton. "Children at play" is a series of twenty three panels incorporated into an 80 metre run of railings at housing estate, plasma cut in mild steel, sited at Wednesfield West Midlands. The site of the housing estate was built on a former childrens school which many local people had memories of. On the site there was a stretch of open grassland between the new houses and the main road where children could play. So the railings were commissioned to delineate these boundaries. The local authorities with an enlightened public art policy suggested to the housing developer that artwork railings would enhance the development. John Mckenna@a4a was approached by the developers' architect and asked to provide a solution from initial concept to final fabrication of the artwork, liasing with the council and developer at all stages. Roundel in stone, 1.2m diam, carved sandstone, sited within entrance gable of science block, The Shrewsbury School. Artwork features for train stations throughout the West Midlands, Canley, Five Ways University station. Sunbeam racing panels three 10ft by 6ft bronze panels depicting land speed record attempts, during the 1920's by the Sunbeam Car manufacturers. Located at the St. Johns Retail Park, Wolverhampton. The Saint Johns Retail Park is built upon the former site of the Star cars factory and is close to the Sunbeam factory, from which came several cars built to test the land speed record. Sir Malcolm Campbell, racing driver at Pendine sands, land speed record attempt 1925. He achieved a record speed of 301 mph a decade later. The 2m by 3m bronze relief panel, featured on the left, is sited at St Johns Retail Park Wolverhampton. Below a bronze panel depicting Henry Segrave at Daytona Beach, the 1927 land speed record attempt. Wolverhampton played a key part in the development of the British Motor industry. Many famous names were manufactured there:- Sunbeam, AJS, Briton, Clyno and Star. These makes were leaders in the field comparable with the likes of BMW and Mrecedes-Benz today. The perimeter wall of the park houses four bronze panels, three of which comemmorate the exploits of the three racing heroes, Sir Malcolm Campbell, Sir Henry Segrave, see above and on right, Kaye Don. Sculptors John McKenna and Darren Sutton, modelled the panels using the drawings designed by Steve Field the Dudley Public Borough Artist, to produce these dynamic bronze panels, cast using the lost wax bronze casting method, by Castle Fine Arts Foundry. Wolverhampton. Große Reliefpaneele in Bronze für ein Einzelhandelsunternehmen, Wolverhampton. Lifesize female figure double sided relief, cast in aluminium and set within a star, at the previous site above. The Commuter aluminium statue 2m high, Snowhill station, Birmingham, unveiled by Neil Kinnock MEP, European Commissioner for Transport. The Commuter being unveiled by Neil Kinnock MEP European commissioner for Transport with sculptor John Mckenna. The aluminium cast lifesize figure is sited at Snowhill, in Birmingham. The area is the financial district of Birmingham and the work on a humorous slant depicts a man of buisiness waiting for a train that never comes! The Glassblower bronze statue 2m high, Stourbridge train station. The figure was initially modelled by John Mckenna in clay using local glassblowers working in the town. Stourbridge in the West Midlands has a continuing glass work industry and the bronze figure is posed in a triumphant stance celebrating the enduring industry and achievements of the glassblowers. Originally the sculpture was made at ground level in GRP but it was subject to minor vandalism so on advice from John McKenna the client commissioned the recasting of the work into bronze. Boulton Paul 'Defiants', brick relief, formerly Pendeford airfield during World War Two, Wolverhampton. fighter planes carved in brick sited into the perimeter wall of a housing estate where the aeroplanes were based. Initially carved in 'green' clay, that is soft brick clay, then left to dry prior to firing. The red brick clay used for this artwork was a Baggeridge Brick company claybody and the firing was undertaken by Baggeridge at their Sedgley Works, in West Midlands. The brick frieze depicting three aeroplanes measured over 9m / 30feet in length. John McKenna and one of his asssistants, Darren Sutton worked over several weeks to undertake the green clay carving. Civil War Drummer wearing the standard attire of the English civil war period. Both Royalists and Parliamentarians had drummers to communicate with troops by coded drum messages. The design of the drums used and the clothing worn were very similar for both factions. Drummers were usually mature men and would carry a sword, but it was not often branded as they did not normally participate in combat. This sculpture stands 60cms tall and is cast bronze as a edition of three, - currently 3 available for purchase. Echo & Narcissus bronze 1/2 life-size figures, permanent exhibition at Gretna Green Museum, Scotland. When the beautiful nymph Echo saw Narcissus hunting in a forest she immediately fell deeply in love with him . This affection was not reciprocated by Narcissus as he was oblivious to the glances of the nymph. Narcissus who had stooped to draw water from a pool had fallen in love with his own reflection. He gazed into the pool both day and night at his own reflection until finally he wasted away. In her melancholic despair Echo wandered lonely in the mountains, longing to to join Narcissus. Brooding continually over her unrequited love she called out for Narcissus to no avail. Slowly she pined away until nothing remained but her voice echoing in the mountains. Pair of half life size bronze figures limited edition. No. 1/6 private client, No 2/6 purchased by the Gretna Green museum and art gallery for "Lovers" exhibition. 3/6 private purchase. Casts 4/6 to 6/6 availabe for purchase. Bilston Industry brick relief sculpture, 3m by 2m wide, Employment Service Agency, Bilston High Street, West Midlands. Bilston Jobcentre: sited at Bilston High Street, in the West Midlands. Brick relief using coloured clay bodies and fired on engobes. Commissioned by the Employment Service Agency as a percent for art initiative.Height 3m by 2.75m wide. Cast stone panels, fifteen panels, TESCO, Leyton High Rd, London. The commission involved us making a series of 15 panels in cast stone, each one approximately 1.2m by1m. The panels were commissioned by TESCO the food retailer to alleviate a brick façade that fronted onto the Leyton High Road in London. No ground floor windows were required in this building so the cast stone panels provided a decorative finish which formed a weather proof facing for the building. Hospital. Nuneaton. Commissioned as part of extensive hospital redevelopment, opened by Her Majesty, Queen Elizabeth II. Glassblower figure in stainless steel, Amblecote Road, Stourbridge. Semi circular brick desk 'hands at craft', depicting the sequence of events in hand brickmaking. Sited at a brick company head office foyer area. 5m diametre.GemeiBelter Ziegelschreibtisch für brick plc, am regionalen Geschäftssitz. Intaglio relief tiles Carolgate Market place, Nottingham. City of Leeds coat of arms, brick relief, Swarcliffe, Leeds. City of Leeds: civic coat of arms, commissioned by the city architects for a public building in the Swarcliffe area of the city. 1.1m by 1m. Burslem Bypass Triptych commissioned by Staffordshire County Council, 1% for art, glazed brick relief, 9m wide by 4.5m high, depicting industries of Burslem. Burslem bypass triptych relief sculpture of glazed brick panels. Burslem, Stoke on Trent, Staffordshire. Staffordshire percent for art initiative. Height approx. 5m by 9m width. Depict the historical industrial occupations of Burslem. Burslem Umgehung- Auftrag für Grafschaftsrat von Stafford, 1% für Kunstinitiative. Glasiertes Triptychon-Mauerrelief - 5m FuB hoch, FuB 9m breit, staatliche Sammlung. Designed War Memorial, 4m high obelisk in various granites, Red Lion Square, Newcastle, Staffordshire. Large Ceramic panels: The panels illustrated on the left are made using clay either a stoneware or terracotta clay body. The figures within the panel are modelled in high relief some sections totally in the round. The size of the panel is usually kept to approximately 90cms by 90cms as to create larger single piece panels involves too many risks in the kiln firing stage of manufacture. These type of panels are ideal for elevated sites on a façade or protected enviroments. They can be glazed but are usually fired to a frost resistant quality. Civic Trust Award:This award designed by John McKenna was used as the Steetly Civic trust award for several years, whilst they sponsored the Civic trust awards. It was presented to a limited number of architecural practices and building developers as an award for oustanding or highly sympathetic building projects.The award itself was made from Cadeby limestone and the design was sandblasted to different depths within the truncated obelisk form. Narcissus: This sculpture made as a gallery and exhibition artwork uses a fired buff stone ware for the head, limestone and mirror glass. Narcissus forever with his own reflection. Approx. 50cms diameter. 'Head within Head': Terracotta and radial brick 1m diameter by 1.2m high. The large head was hand formed as a single hollow piece. It emerges centrally from the brick 'well' and is framed by stepped bricks. Sculptures en bronze, Sculptures de lieu public, Sculptures de relief en brique, Portraits sculptés, Reliefs architecturaux, Statues de jardin, Sculptures en pierre, Mosaïques, Sculptures de lettress, Ouvrages en acier soudé, Ouvrages en fer forgé, Sculptures figuratives, Sculptures mythalogiques, Sculptures monumentales,Sculptures de fontaine, Pierre de béton, Aliminium fondu, Conseils artistiques, Installation d'oeuvres, Eclairage, Mobilier urban, Bornes, Ateliers d' art, Commandes acceptées, Ateliers de sculpture, Création de modéles de fonte, Piéces moulées a` la cire perdue, Agrandissements, Construction de moules, Objets métalliques architecturaux, Conception d'aires pavées, Sculptures en inox, Obélisques, Tirages en bronze, Moulages uniques, Plaques de bronze, Sculptures municipales, OEuvres d'art personnalisées Sculptures en béton, Portails d'entrée, Projets associatifs, Projets en internat, Fibre de verre. John McKenna and associates at Art for architecture create bronze sculpture, public art sculpture, sort and celebrity portrait busts and statue memorials, brick relief sculpture, architectural relief art, garden statuary, terracotta sculpture, glazed brick friezes, stone carving, mosaic, letter carving, steel welded artworks, wrought iron works, figurative sculpture, narrative sculpture, mythological sculpture, monumental sculpture, fountain sculpture, cast stone, cast aluminium, art consultancy, design installation, lighting, street furniture, bollards, art workshops, commissions undertaken, sculpture workshops, pattern making, lost wax casting, enlargement, mould making, architectural metalwork, paving design, stainless steel sculpture, obelisks, editions in bronze, unique castings, bronze plaques, civic sculpture, site specific artworks, concrete sculpture, entrance gates, community projects, residencies, fibreglass.Below is listed Public artwork and some private commissions produced by John McKenna from today back to John's career outset back in since 1987. 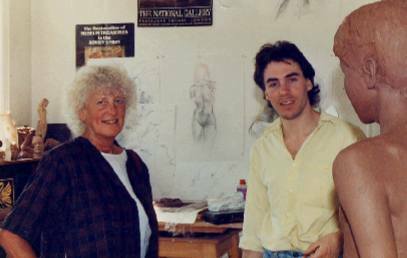 Above picture shows a younger John McKenna as a student of the Sir Henry Doulton School of Sculpture standing alongside the world renowned sculptor Dame Elizabeth Frink, in the foreground is McKenna's 'Bather' statue at its clay modelling stage. Liz Frink was a great friend to the school and often the students would visit her former studio near Blandford Forum. As the patron of the Sir Henry Doulton School she often visited to discuss aspects of working with the students, culmanating in a retrospective sculpture exhibition at Keele University where John and other students exhibited their work alongside Dame Elizabeth's. We also have a studio bronze foundry where we can cast bronze sculpture artworks for ourselves or on occasion other artists.